This statistic is based on a survey conducted in June 2016. It shows U.S. adults' opinions on whether health research has made an improvement on their family health. 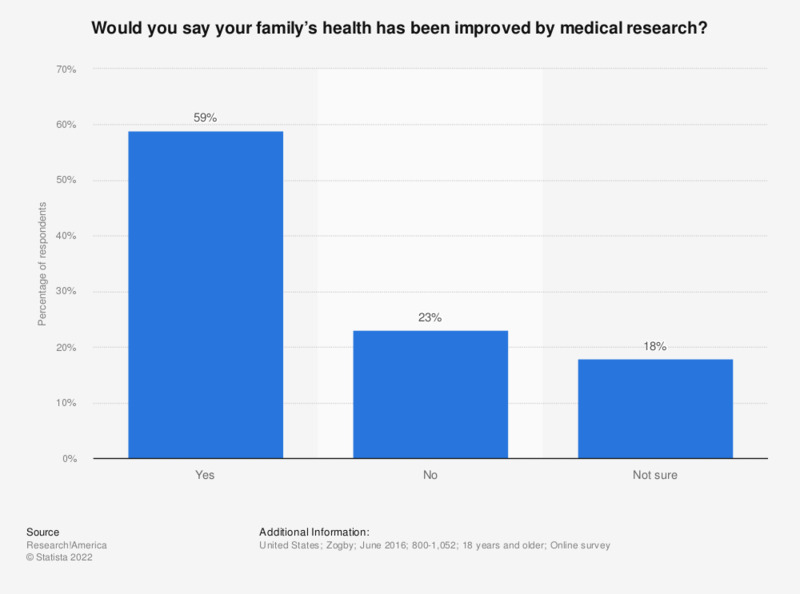 Some 23 percent of adults claimed that health research has not improved their family's health. New legislation has been announced that would help improve the state of health care and medical research, especially as citizens believe that research is important for development of the economy. When it comes to rising health care costs, would you say research to improve health is part of the problem or part of the solution? How important is it that our nation supports research that focuses on improving how our health care system is functioning? Which one of the following do you feel should have the most influence on how government funds for research to improve health are spent? Do you believe the use of animals in medical research is necessary for progress in human health? How important, or unimportant do you think mental health services should be in terms of priorities for the NHS?